We have purchased a pot puller and shrimp pots from Quality Products NorthWest. We love them! We live in the Pacific Northwest where seafood is bountiful, especially when you are lucky enough to be able to go out 3 or 4 times a week! We have tried other pot pullers, but this one is really strong and made to last. We pull up commercial sized crab pots with ease! The shrimp pots are the largest capacity available. 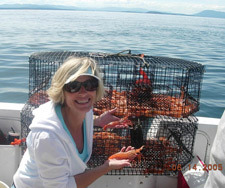 We have had such good luck with our shrimp bounty each time we go out, that all our friends are wanting shrimp pots and pullers from Quality Products NorthWest, LLC. We just keep giving out their number! The crew at Quality Products NorthWest are friendly, helpful and go out of their way to make sure you get your order quickly! After your first conversation you will feel like they are old friends! Shrimp season opens soon! See you on the water!